Very nice bit of kit actually, time will tell if it lasts but seems quite robust. I have no idea what it is supposed to look like - what I can say about this bag is that I use it almost every day. I carry ammo, pistols and ear muffs to the range in it, I use it for an overnight bag, and I even use it as a briefcase since my laptop fits in it (as does my ipad or kindle, of course). Does it look like a british WWI shoulder bag? Who gives a s%&t! Any bag that will stand up to 200 rounds of 30-06 ammo, earmuffs, spare sling, tool kit, and all the other crap I put in it, looks great, and only costs $45 is a winner. Very nice! 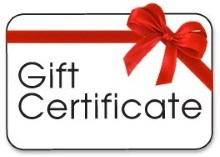 It will get great use! Great bag that fits the name "general purpose" well. Smart looking, big enough to fit my 13" laptop inside (not for reenactment), great as a tote bag to carry things while riding my bicycle (not for reenactment), and I guess you can also use it for reenactment. A very stylish bag that is history related and can be used for contemporary life. A true classic. Speedy shipping to southern Europe. Another "Gem" from WPG!!! Super Buy!! plan on buying another soon! Has a minor blemish on the leather of the bottom part, but apart from that,this is a great bag! More quality than I could have imagined. Leather is soft/suple, Button holes beautifully reinforced. Well stitched and great for either the Great War or WWII. It''s big enough to hold a small laptop! Only flaws: a few loose threads (easy to cut off) and I''m not sure of the durability of the sheet-brass ''rings'' which attach the strap to the bag itself. So far they''re okay, but prolly could be sturdier. Another hard to find item. Really well made and the great thing about this bag is that I can use it every day (as a photo Bag) and in my WW1 impression. Fabulous item, exceedingly well made and well worth the purchase price.Owned an origninal some years ago and this is spot on to my memory of it - except brand new! Excellent reproduction and Excellent service. Truly, a first class piece of kit. I've had several haversacks over the years, but this is the best by far. The best part, it will only get better with age! WPG is my benchmark from which I judge most other companies in service and delivery. Well Done! Item is very well made. Looks like a great copy. Very fast service. One of the metal clasps on the bags strap is broken. A very useful good looking, tough cotton canvas kit bag made in India. If you think it needs a bath, it can be safely hand washed. Use a desert spoonful of soft liquid soap suitable for cotton fabrics. Before immersing the bag in a tub of warm water I rubbed Gardeners Hand Cream into the soft leather and left it for 24 hours. When washed and rinsed with running water, I left the bag hanging at an angle to drain the inside. The leather remains soft and pliable. The Brass fittings are better than found on some WWI relics, and that's okay by me since I bought one for general use rather than re-enactment. Various types of Musette bags were available for officer's to purchase privately and there were single or double strapped flaps. This particular WPG design is similar to the US M1921; interior same in M1936 pattern. 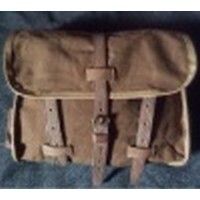 I have a WWI Australian light horseman's canvas & leather satchel that's different again. Only a couple of fabrication faults to mention on mine. The leather being thinner than expected was cut unevenly along the front with some dodgy stitching roughly missed at the corner. Consequently the top edge of the end leather was 1/4" higher. Needed repair to improve appearance as obvious when noticed. The shoulder strap was unevenly dyed too but Jerry offered a replacement. I declined. With use the brass fittings don't grip the webbing strap firmly enough to stop it slipping. Decided to replace it with leather as seen on most originals. All things considered I'm pleased with this. It's a smart, sturdy and adaptable kit bag. Excellent value. Good customer service and super fast delivery. A very useful bag of excellent quality. The improved Bag are much better than the first Version. I like it !!! An outstanding item, super quality and fills a empty spot in my kit. Wow, what a great item. Much better than I thought I might get. This is really a great piece and the price is fantastic! Best item that I ordered and extremely fast shipping! Another of Jerry''s winners! Since officer''s gear was all private purchase, there is no absolute standard, but this is the sort of haversack I would have wanted in 1914-18 as a mounted officer. Its internal arrangement closely resembles the US M1936 field bag (musette bag), while its outside is of superior quality. It can be carried on the Sam Browne belt, slung from its strap, or carried as an off-side saddle bag, relacing the rifle bucket, not carried by officers, and balanced by the sword, shoe case, picket pin, etc, on the near side. Delivery, as usual, excellent. Well done again! This was much better than I expected. As a matter of fact all the items that I ordered were very good to excellent quality . And the prices were very much in line with what I like to pay. What really surprised me was the swift delivery of all the items. Some arrived within 4 days of ordering and the last came only one week after the initial order. Extraordinary !!! This bag is very useful, and quite possibly of a higher quality than the originals. Very sturdy and well made and shipped promptly. Very period appearance, looks impossible to destroy. One spring on a strap-snap was turned out, but was easy to put back in place. I''ve been looking for a bag like that for a long time, but: "Napoo originals"! All the more happier I am about WPG''s reproduction. It is very well made of sturdy canvas, roomy and looks very good. I am, as always, delighted by WPG''s fast, efficient and friendly customer service. Compliments from a satisfied returning customer! Superb! Very pleased indeed.Terrific quality,and great value.Service excellent as usual. Bag is nice. Planned it as a gift good thing lI unpacked it...the strap was filthy,soot stained! Recieved mine on Friday, and it is a spectacular bag. The perfect finish for my corpsman impression !! Identicle to a original in my collection. In use every day. Great product. Looks really terrific. Good job, Jerry. This is an excellent reproduction of a rare bag. Thanks for making gear that no one else makes! This is an excellent reproduction of the officer Musette bag, lots of room for carrying all kinds of gear.